Did you know that spider veins can occur anywhere on the body? Though mostly thought of as a leg issue, these tiny veins can become damaged due to insufficient blood flow on the chest or upper abdominal region. Veins presenting in this area can be caused by various illnesses, hormone fluctuations, and even sun damage. In women, pregnancy can be a primary suspect while blood clots, liver cirrhosis, and even DVT can also cause them. The breast area can also be a place where veins become visible. It isn’t unusual for the appearance of bluish veins to become more noticeable if implants are placed. They stretch the skin making them seem closer to the surface. Telangiectasias, also a form of spider vein, are broken blood vessels found near the surface of the skin. They can range in color from blue to purple to even reddish. They generally are found on the face, nose, cheeks, and chin. They start small and tend to branch outward if left untreated. They can be caused by sun damage or impact. 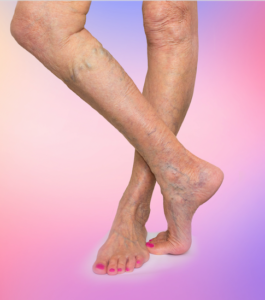 While Telangiectasias and Spider veins both can be simply cosmetic in nature, for some they may also cause medical issues and should be examined by a Vein Specialist as soon as you begin to notice symptoms. Work that stands or sits all day long, every day. Lack of circulation and movement can play a large role in development. Obesity – being overweight puts extra strain on your entire circulatory system and can cause a breakdown in the valves over time. Birth control pills – Altering your body’s natural hormone levels can bring on vein issues. Postmenopause hormone treatments – again, altering the hormone levels can confuse the body and cause issues. Constipation – that excess pressure of pushing to go can cause not only hemorrhoids but varicose and spider veins. Eat more fiber in your diet and do not strain. Tight clothing such as corsets and girdles – the lack of circulation can constrict veins to the point where they cannot flow properly. If you notice spider veins starting to creep in anywhere on your body, face, neck, chest, trunk, abdomen, or legs, give West Florida Vein Center a call today at (727) 712-3233 or visit online www.westfloridaveincenter.com for the best vein clinic in the Tampa, Florida area.